I always have bananas in the freezer. I can never eat them in time…they always turn brown on me! Probably because we buy them at Costco and there are a ton in a bunch…and Josh hates bananas! But the good news is that I get to bake with them! This time I made a banana snack cake with cinnamon chips. If you can’t find cinnamon chips, I am so sorry! Luckily, I can find them at a couple different stores in Salt Lake. They are oh so good! I thought the banana/cinnamon combo would be nice and I was right! I love it when that happens:) The cake was really moist…even though there is NO butter or oil in this recipe. I promise the bananas do their thing and the cake has a great texture. I added a cinnamon sugar topping to finish off the cake. I loved the cinnamon crunch it added. If you can’t find cinnamon chips, try chocolate or peanut butter chips, I am sure they would be tasty too!! Preheat the oven to 375 degrees Fahrenheit. Spray an 8-inch square pan with cooking spray. In a medium mixing bowl, mash the bananas well with a fork or potato masher. Add in the eggs and vanilla and mix until combined. Stir in the flour, baking soda, cinnamon, and sugar. Add ¾ cup of the cinnamon chips, and stir briefly. Pour the batter into the prepared pan, and set aside. In a small bowl, stir together the topping ingredients. Sprinkle the mixture evenly over the batter in the pan, and top with the remaining ¼ cup chips. YUM! I love baking with bananas. The cinnamon chips are amazing! Publix just started carrying them and I am thriled! Sounds wonderfully delicious with cinnamon chips! Cinnamon chips sound fabulous … I want some! Thanks for sharing this recipe, it looks delicious … and I like that it has no butter or oil. very original idea to combine banana and cinnamon!! I’ve never thought that way! it looks delicious! Lovely cake! I also love the combination of bananas and cinnamon 🙂 Your cake looks very moist even though it doesnt have any butter in it. Excellent! grrrr.I can never find cinnamon chips!!! I am always looking for baking recipes with bananas!! your cinnamon chips it sounds fabulous, brilliant bake!! Yay! Looks like it was wonderful. I made my loaf w/ half whole wheat flour and you couldn’t detect the difference at all. Will have to try your healthier version! Thanks everyone!! I promise this is really good without butter or oil. Veggiegirl and Leslie- Sorry you can’t find the chips! Every store needs them! Recipegirl-I will have to try whole wheat flour next! Ooooh, I love this! Great combo! This looks delicious! I’ve never seen cinnamon chips here in Los Angeles, but might mail order for some…they sound fantastic! Food Librarian-The cinn. chips are sooo good! They are worth ordering! Love when I have all the ingredients! Maria This looks great a usual I say the cinnamon chips last week not I need to remember where thanks. Looks great. Yum. I love banana cake and adding cinnamon chips makes it even better. Kat-Caramel chips sound awesome! Let me know if you try it! Pam-Cinnamon chips make everything better! I love making banana cake without butter or oil, I made up a chocolate version just the other day. The cinnamon chips sound delicious! I’ve never seen cinnamon chips before – will have to go on the look out. everyone has access to these wonderful cinnamon chips but me! I would love to make so many things with them, and now banana cake. Can you mail this to me??? I would love some right NOW! We have a lot of Costco bananas around too. Sounds like a great way to use them. Dawn-Sorry you can’t find the chips!! Hopefully they will turn up soon! I may make this today, but sub with choc chips, as I have no cinnamon. I love baking with bananas. Thanks for the recipe. It looks fantastic!! First of all, those cinnamon chips are a total godsend. Amazing find. Love them! I’m with Josh–I don’t like bananas, BUT, and that’s a big but, I like them in baked goods. Soooo, this snack cake is the perfect way for me to sneak bananas into my diet (haha, not the healthiest way, I’m sure). This looks fabulous!! this looks so yummy! i love cinnamon anything. How strange, we were talking about banana cake in work the other day and I said I’d make one. Now, with cinnamon chips it sounds double yummy – although I’ve never seen them in our shops. So – Chocolate chips and banana is the way to go! Thanks for sharing it looks delish! This banana cake rocks!! I love cinnamon chips! YUMMMMMMM!! Yumm. This looks delicious with those cinnamon chips. Banana cake is a favorite here and I love this healthier version of an old standby. That looks SO good! I haven’t found cinnamon chips yet, but have PB chips that would be good in there too…but cinnamon…mmmm…yum!! oh my goodness this looks amazing!!! I just found your blog on mormonmommyblogs– im a follower now!! 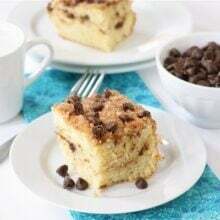 Maria, your banana cinnamon chip cake sounds and looks simply wonderful!! I wish we could get cinnamon chips here in the UK but no such luck. Those melted chips look so good! Maria that is sooooooo good! ohh! banana cinnamon! so delicious! i still cannot find the cinnamon chips near me! I have more brown bananas than I know what to do with. Thanks for sharing your recipe. I actually have some cinnamon chips. They are difficult to find. I’ve been saving them for just such a recipe. Love the combo of banana and cinnamon! I also love that this has no oil! Ooooh, that looks so yummy, what a great combination! That sounds really good! I was just looking for cinnamon chips at my local grocery store and couldn’t find them. I’m gonna look at a few more places. Thanks for sharing the recipe! Yum. Your cake sounds amazing. I actually have the opposite problem. I have to buy bananas to deliberately let them go overripe if I want them for baking. I always eat all my bananas. I feel like bananas are either green or brown… they’re never the colour I want them to be to just eat! I love those cinnamon chips and stock up whenever I can find them. I’ve never thought of trying them with bananas, what a great idea! Looks super yummy! It looks incredibly moist. 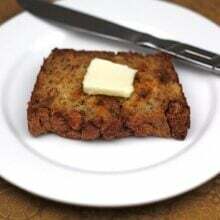 I love that there is no oil or butter in there! Amazing. Definitely gonna give this one a try. 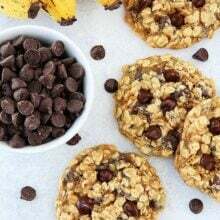 I love all things banana, as you can tell by my latest post–banana peanut butter cup cookies. These look great. A frozen banana on its own is quite tasty :). I love cinnamon chips, what an awesome invention. Hope you’re feelin’ better, have a great weekend! This looks divoon! Would never think of the cinnamon chips, I bet that is incredible. 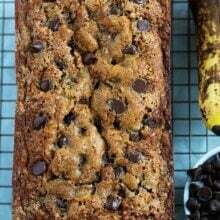 I love banana cookies, cakes, etc so I’ll be sure to try this! Oh goodness, this is seriously fabulous. What a unique but mouth watering combination!!!! This looks SO good 🙂 I love new ways to bake with bananas! OH MY GOSH, SUPER SCRUMPTIOUS! Cinnamon makes everything better…be it savory or sweet! This just makes me wanna yell “YABBA DABBA DOOOOO”! I love bananas, unfortunately, they hate me. would you believe I am allergic to them? I’m sure these tasted wonderful, but I will never get the chance to try them. (Sniff). I borrowed your pic because I gave this cake my Holy Yum award! I hope that is Ok! Feel free to post about and/or display the award. That looks so good! I am going to have to see if I can order some cinnamon chips online. This does look amazing! I really can’t wait to try it. I’m so excited for you for Tuesday! This is finally in my oven (with tiny fat loving alterations :p) … Cinnamon chips are better than I would’ve ever imagined! Thank you! We really loved it! It is so fast to mix up. Thanks for sharing your creation. Just made this tonight. It was a big hit with my family. I truly could not tell that it had no oil or butter. Definitely a keeper! I just posted this – it was SOOOOO good! I’ve yet to try cinnamon chips, but they sound great, and this cake looks wonderful. Julie-so glad you liked the cake. We love that one too! Glad you are enjoying our recipes. Thanks for letting us know! YUM! I made this last night and we ate it for breakfast this morning like a coffee cake. HEAVENLY!!!! I too love to bake and will definitely make this wonderful cake again. Thank you so much, Steph. I substituted chocolate chips and this was great. I was unsure because there is no oil and thought I had made a spelling mistake but it turned out well! Okay so I made this cake last night and it was AMAZING! I did a couple of things differently because of what I had. I ran out of cinnamon chips but had about a heaping half cup left so I just used that for inside the cake and topped the cake with about 1/3 cup mini chocolate chips. I used turbinado sugar for the topping for extra crunch and used about 3/4 cup sugar in the cake as opposed to 1 cup (and it was plenty sweet!). Oh also I had small bananas so I used 4 instead of 3. I used cake flour instead of all purpose because that is what we had. My cake ended up taking 25 minutes in the oven but I credit that to the “Perfect Brownie” pan I was using. NO ONE could believe that there was no oil, this cake has SUCH an amazing flavor and its so moist!! The combo of cinnamon AND chocolate chips was a definite winner. Next time I think I will mix the cinnamon chips with the flour before adding it to the wet ingredients because the cinnamon chips kind of sunk to the bottom a little. Also I want to try it with whole wheat pastry flour! THANK YOU SO MUCH FOR THIS RECIPE!! I love the changes you made. Thanks for sharing! The cinnamon chips contain fat as a binder. Suppose I were to leave them out, would the cake still turn out delicious? This is delicious. I decided not to wait to find cinnamon chips and I improvised by nuking white chocolate chips for a few seconds (not enough to melt, just so they aren’t cold) and then coated them in cinnamon. I also used chocolate chips on top; and used less sugar then the recipe calls for because the white chocolate chips do add a lot of sweetness. Thanks Maria I love your blog!!! I just made this cake and I must say I am pleasantly surprised. The bananas definetly make up for the lack of oil or butter in this cake. I used all whole wheat flour and only a scant 2/3 cup of sugar. I also forgot about the cinnamon-sugar topping. It was still delicious, moist, and very flavorful!! Oh, I just fell upon this recipe from the byways and highways of the internet and I have a jar of cinnamon chips and bananas in the freezer–This sounds like fun. Than you. Thia tastes amazing! I replaced the granulated sugar with coconut sugar. The coconut sugar has some health benefits, so it makes it slightly healthier. It doesn’t change the taste either! Hey! Just curious, have you ever tried to substitute regular flour with coconut flour? I have a large jar in my pantry, and I am trying to find recipes to use them in.